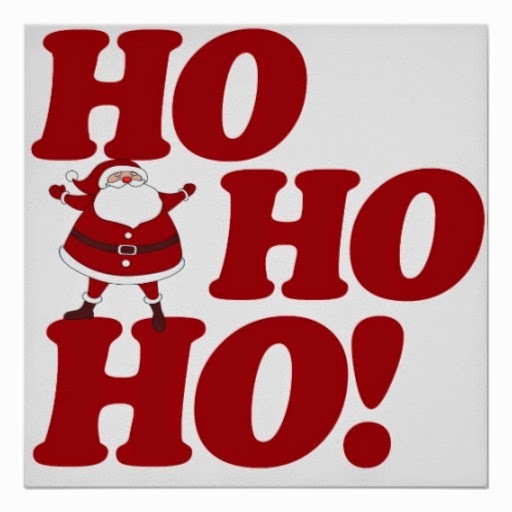 Ho, ho, ho”! That was a merry, merry meeting we had, mostly dressed in red and white with red caps. As the last meeting of the year 2014, this is one meeting that we “saved the best for last” and illustrated all our resolutions regardless whether they will be fulfilled or not. Resolutions are to be made but not necessarily kept. 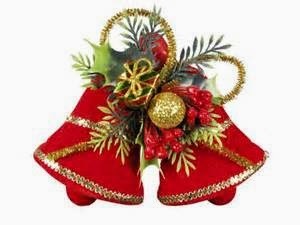 “Ho, ho, ho”! 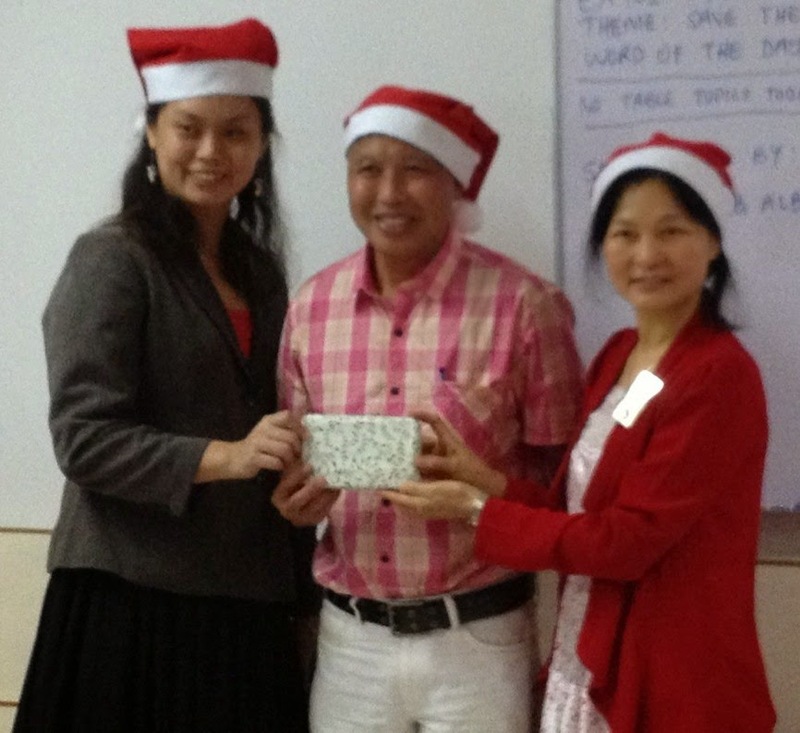 We bid a very warm, merry welcome to General Evaluator, Henry Fu, ACB, ALB from D’Utama Toastmasters Club and Metropolitan Bilingual Toastmasters Club. Thank you for being with us on this gracious occasion. We also welcomed Alex Lu, ACB, ALB, Sim Bok San, CC, Wong Keng Lan, CC, Chee Ai Lieng, CC, May Ong and Choong Qian Wei for your presence at this special meeting. Thank you for being with us. ASA, Ken Koh, ACB called the meeting to order at 7.20pm as all were too engrossed in the fun, chatter and great food for this special, merry meeting. Well done, Ken! The TME for this meeting was May Ong from Open University Malaysia Toastmasters Club who ran the meeting in her own special style and unique way. Stupendous, May! President, Jeannie, ACS reminded all that “saving the best for last” is important in every stage of our lives as we need to meet and overcome all obstacles in our path in order to reach our goals, where our resolutions are waiting patiently for us. We will take heed, Jeannie! 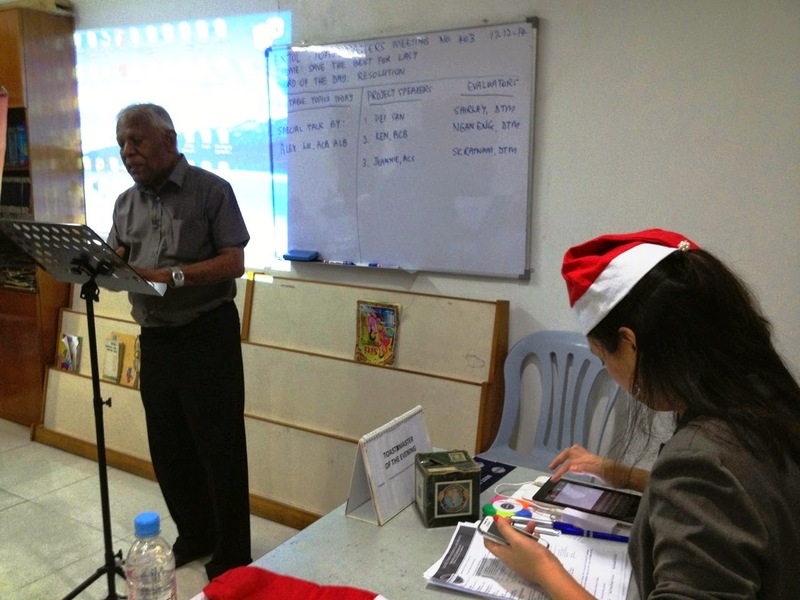 Grammarian, Immediate Past President, Pun Yew Kee introduced the Word Of The Day, “Resolution”, this unique word which always surface at every year end but would always seem far-fetched and unattainable later on. Therefore, some declared that they do not observe resolutions but will just take each day at a time. Wonderful explanation, Yew Kee! The invocator, SK Ratnam, DTM exemplified the paradoxical commandments, “Do good anyway, think good anyway”, in the face of all negative circumstances, which was most apt for this last meeting of the year. We shall always demonstrate positivity, SK! 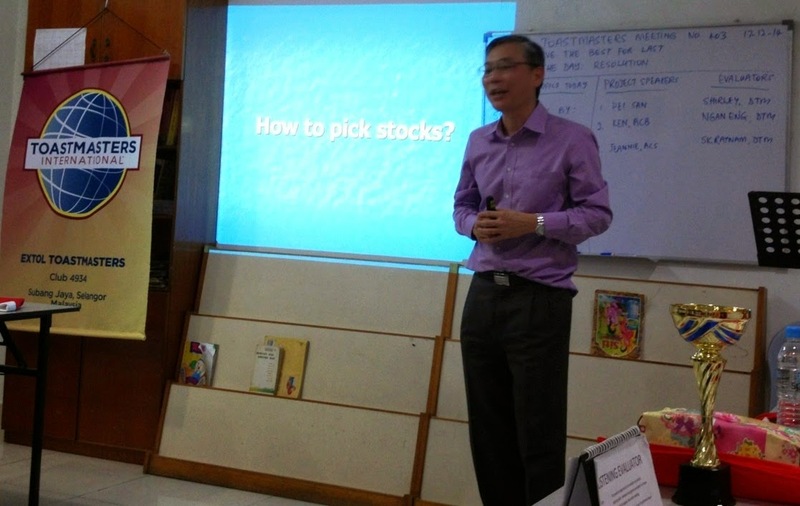 The Table Topics session was cancelled to accommodate a special talk and investment workshop by Alex Lu, ACB, ALB, from IEM Toastmasters Club and a remisier with Kenanga Investment Bank Bhd. It was a most informative, beneficial and enlightening talk in this economically stressful times when the prices of everything rise except our income. Thank you, Alex! The first prepared speech by Pei San, CC#3 titled, “Dress for success” was most fitting for this year-end meeting as we need to be suitably attired to constantly meet new challenges in the new year and years to come. Spectacular speech, San! Her evaluator, Shirley Bak, DTM concurred that her speech not only met the objectives of her speech but was very relevant, applicable and useful for us. Thank you, Shirley! Second speaker, Ken Koh, ACB did an Advance Manual speech from Storytelling #1 titled, “Dare to be champion”, which highlighted the goals we need to overcome to reach eventual success which was most suitable for this meeting, too! Well said, Ken! His evaluator, Kwa Ngan Eng, DTM agreed that the speech was well done, unfortunately it did not meet the objectives for it was a personal story and not a folk tale. Thank you, Ngan Eng! Third and last speaker, Jeannie, ACS presented an Advance Manual speech from Special Occasion Speech #4 titled, “You are a star”. The setting was concerning our club regular meeting attendance record for the first half year. There were five club members who had attained at least 80% attendance and two had 100% attendance. One of them was Kwa Ngan Eng, DTM, the star of this speech. Well done, Ngan Eng! A really motivating speech, Jeannie! 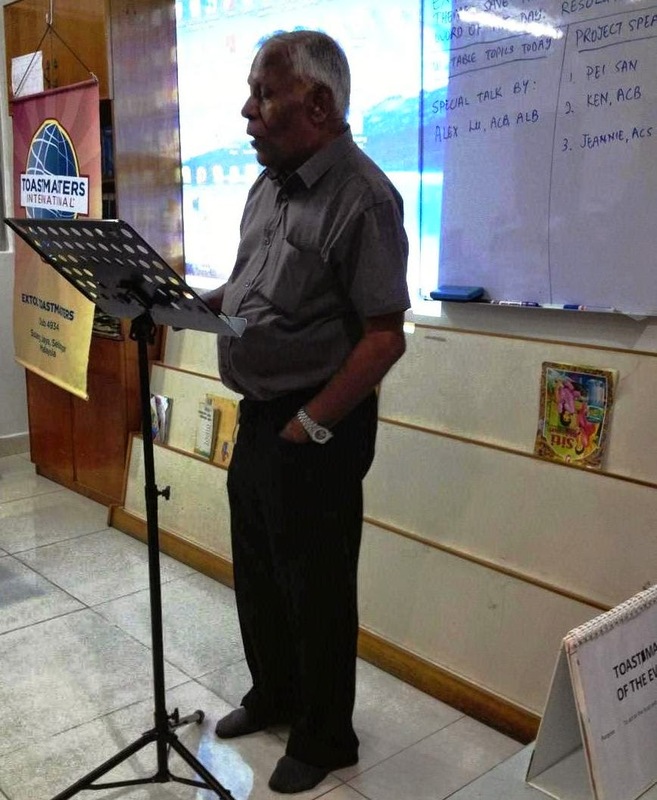 Her evaluator, SK Ratnam, DTM was satisfied that all objectives of the speech were met, however, he expected some anecdotes and humourous stories which would have added flavor to the speech. Thank you, SK! 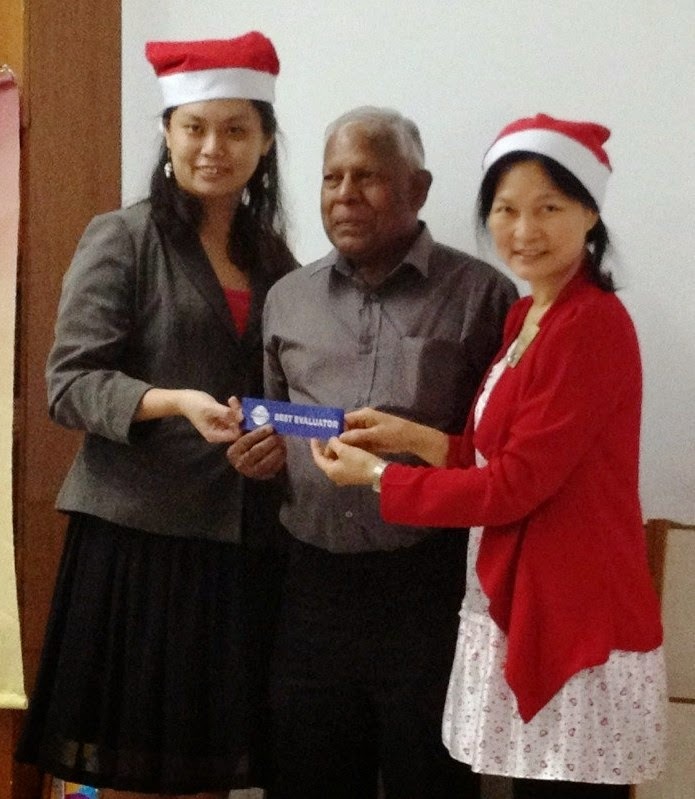 The Best Speaker was Pei San and the Best Evaluator was SK Ratnam, DTM. Congratulations, San and SK! 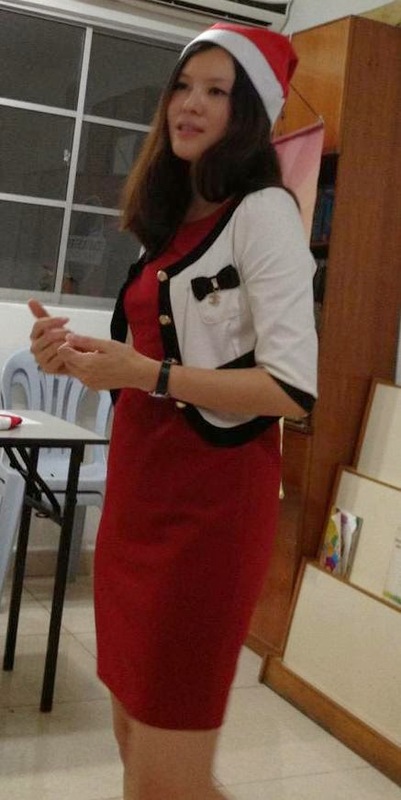 First time Ah Counter, Choong Qian Wei from Sime Darby Healthcare Toastmasters Club was very attentive and reported on the word crutches used by the members which contributed some earnings to the club. Remarkable job, Qian Wei! Pun Yew Kee, was very succinct as a Grammarian and reported that all had used the Word of the Day. There were also many creative usages of words and sentences. Excellent job, Yew Kee! 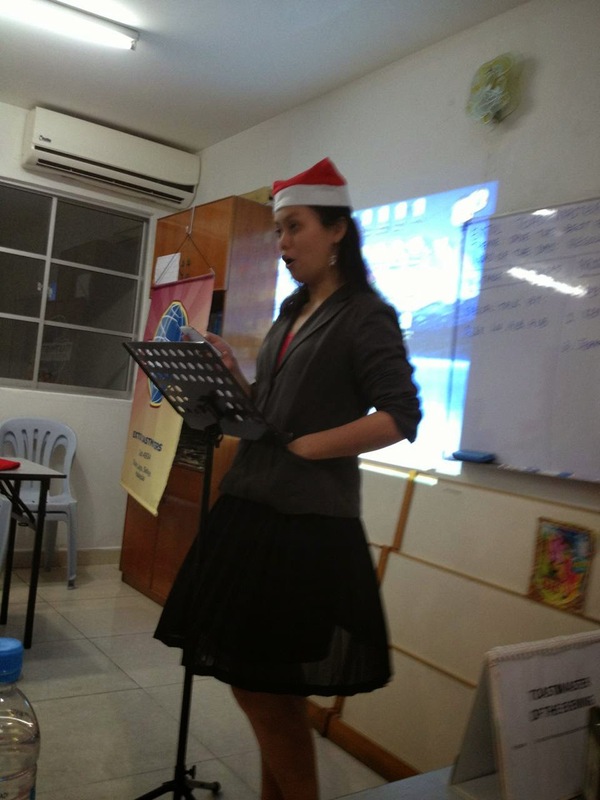 Chee Ai Lieng, CC, the Timer, also from Sime Darby Healthcare Toastmasters Club was very meticulous in her timer’s report. Well done, Ai Lieng! Listening Evaluator, Tan Joke Boey required numerous answers to each of her ten questions but amazingly, President Jeannie, ACS produced all the correct answers to eight questions and she received the Best Listening Award. Marvellous job, Joke Boey and congratulations, Jeannie! General Evaluator, Henry Fu, ACB, ALB felt the warmth and happiness lingering throughout the meeting and was also very pleased with Alex Lu, ACB, ALB’s financial workshop. Thank you again, Alex! However, he requested our executive committee members’ telephone numbers to be displayed in the meeting agenda to facilitate easy contact by interested parties and also to change our meeting venue address in our Blogspot to avoid confusion. We shall do so, General Evaluator. Thank you, Henry Fu, and we welcome you to our meetings again! In closing, President, Jeannie, ACS reminded all that the International Speech and Table Topics Contests is on 7 January 2015 at the meeting venue. All club members, do come in full force to support all the contestants! See you at our next meeting on 7 January 2015! We had a most cosy meeting with an awesome Table Topics session and an uplifting prepared speech session which ended with an enriching evaluation session. This was also one meeting to remember for we have reached Distinguished Club status for our term. Well done, all members who have made this possible! 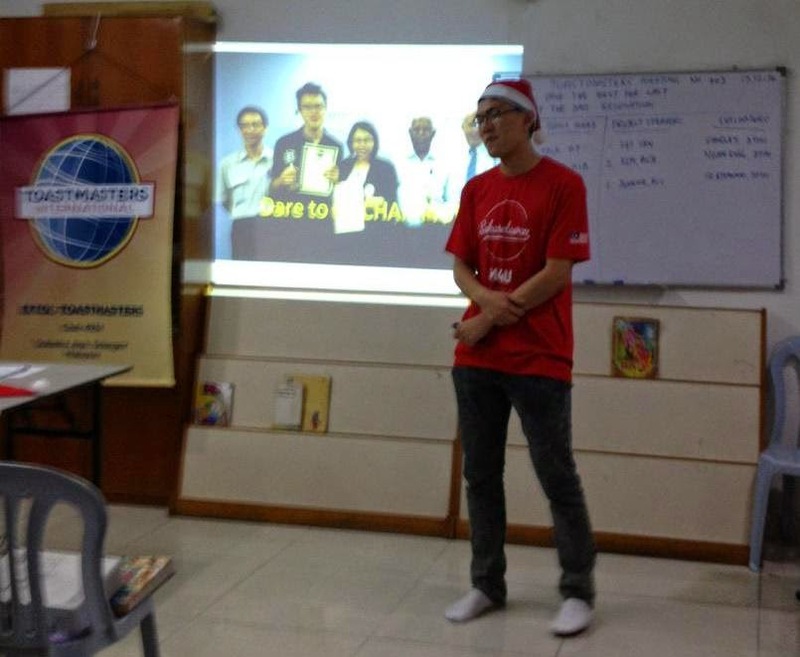 First and foremost, we welcomed our genial General Evaluator, Lim Thian Seng, ACG, ALB from Taman Indrahana Toastmasters Club. Thank you for gracing our meeting. ASA, Obaidullah, CC called the meeting to order at 7.10pm after everyone had their refreshment. Very timely, Obaid! 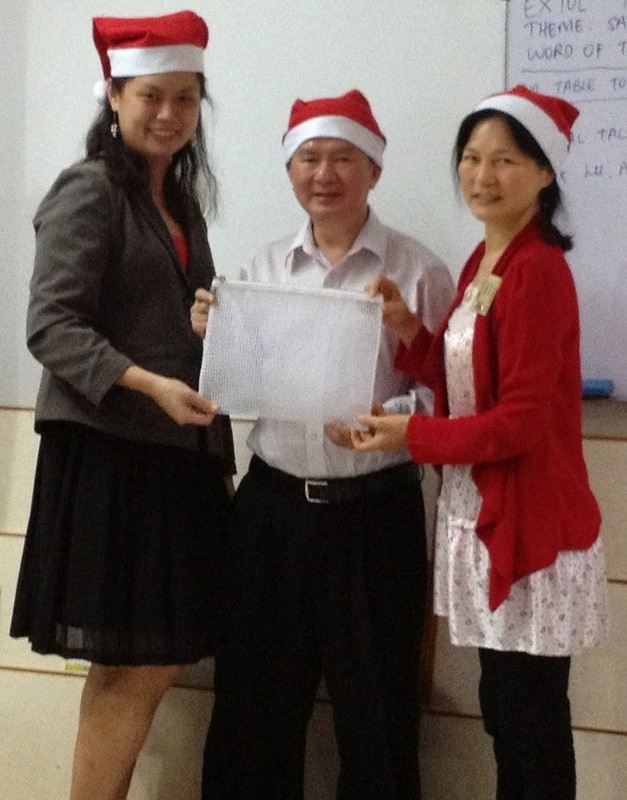 Our immediate past President, Pun Yew Kee who was TME ran the meeting efficiently, effectively and smoothly. Kudos, Yew Kee! President, Jeannie, ACS enthused all to follow the theme of the meeting “Practice makes perfect”, if we are determined to be excellent public speakers and competent leaders, this is one of the methods to achieve our objectives. President, Jeannie, ACS who was also Grammarian, introduced the Word Of The Day, “Determined” which is an essential ingredient to make “Practice makes perfect”, a part of our lives. 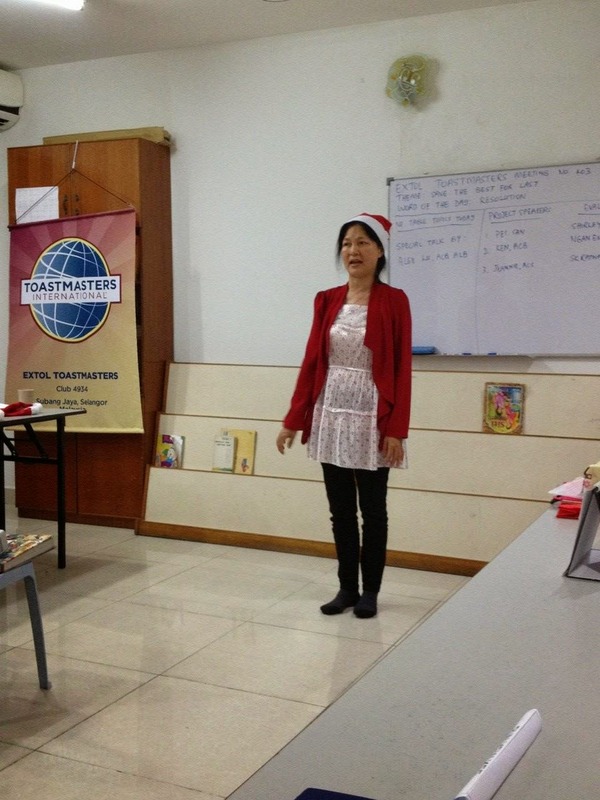 We are determined to practice, Jeannie, especially our public speaking skills! The invocator, Kwa Ngan Eng, DTM reiterated the theme, “Practice makes perfect”, in her invocation speech. She admonished that practice may not make us perfect but will bring us closer to perfection and make us aware of our limitations. Well said, Ngan Eng! The Table Topics Master, Tan Joke Boey conducted the Table Topics session with her unique questions on the happiest colour, best boss, childhood fruits, sports/activities to learn from, most beautiful place and who to share good news with. However, the members were not put off and volunteered readily! They were determined to practice to be perfect. Pei San, SK Ratnam, DTM, Jeannie, ACS, Obaidullah, CC, Kwa Ngan Eng, DTM and Pun Yew Kee volunteered and expounded noteworthy speeches. All of you are really awe-inspiring, determined speakers! 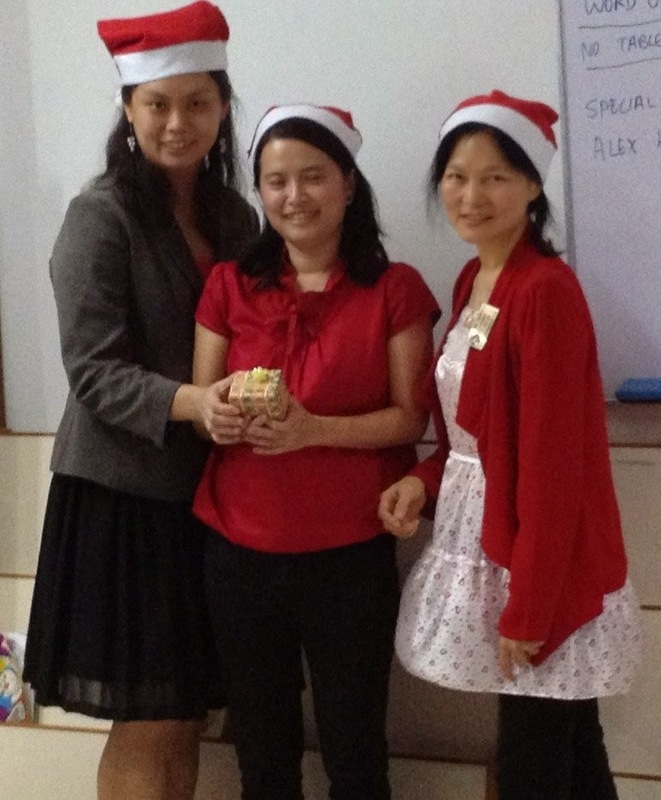 The Best Table Topics Speaker went to Kwa Ngan Eng, DTM. Congratulations, Ngan Eng! Humour Master, SK Ratnam, DTM shared various marital jokes which astounded and humoured everyone. You are a real joker, SK! Table Topics Evaluator, Alicia Wong, ATMB was very comprehensive, candid and observant in her evaluation of the voluntary speakers. Remarkable job, Alicia! The first prepared speech by Pei San, CC#2 titled, “Is work life balanced?” which enunciated a stressless work life was very pleasantly and smoothly presented. Marvelous speech, San! Her evaluator, Kwa Ngan Eng, DTM was thoroughly satisfied with her speech for she not only met the objectives of her speech but had demonstrated many other traits as well. Thank you, Ngan Eng! Alicia Wong, ATMB, did an Advance Manual speech from Speaking To Inform #1 titled, “When you see a tiger…” amazingly also another speech that taught us how to deal with stress. Now, we really know how to face and overcome stress, Alicia and Pei San! Her evaluator, SK Ratnam, DTM was satisfied with her delivery of the speech which was all-encompassing. Thank you, SK! 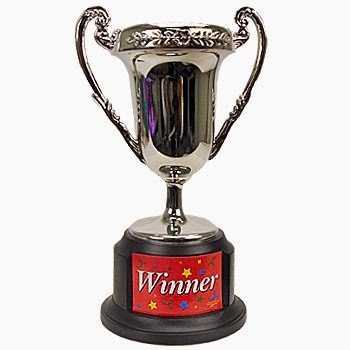 As there were only two speakers, there was no voting for Best Speaker and Best Evaluator. Ah Counter, Tan Joke Boey reported on the word crutches used by the members during the meeting that provided some earnings to the club. Fabulous job, Joke Boey! 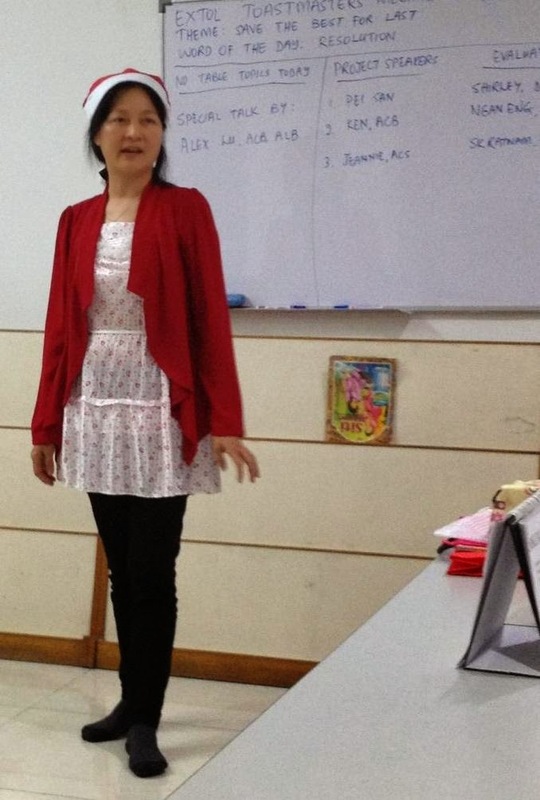 Jeannie, ACS, was very comprehensive in her Grammarian role. She reported that everyone had used the theme to relate to their personal experiences but only two members had used the Word of the Day. Nevertheless, there were many creative usages of words and sentences. Superb job, Jeannie! Obaidullah, CC, the Timekeeper, timed and reported the meeting accurately. Very meticulous job, Obaid! Listening Evaluator, Obaidullah, CC, picked ten apparently simple questions from speeches presented at the meeting but incredibly only Alicia Wong, ATMB had eight correct answers and she received the Best Listening Award. Brilliant job, Obaidullah, CC and congratulations Alicia Wong, ATMB! General Evaluator, Lim Thian Seng, ACG, ALB was very pleased with the whole proceedings of the meeting and declared to return again as our General Evaluator. 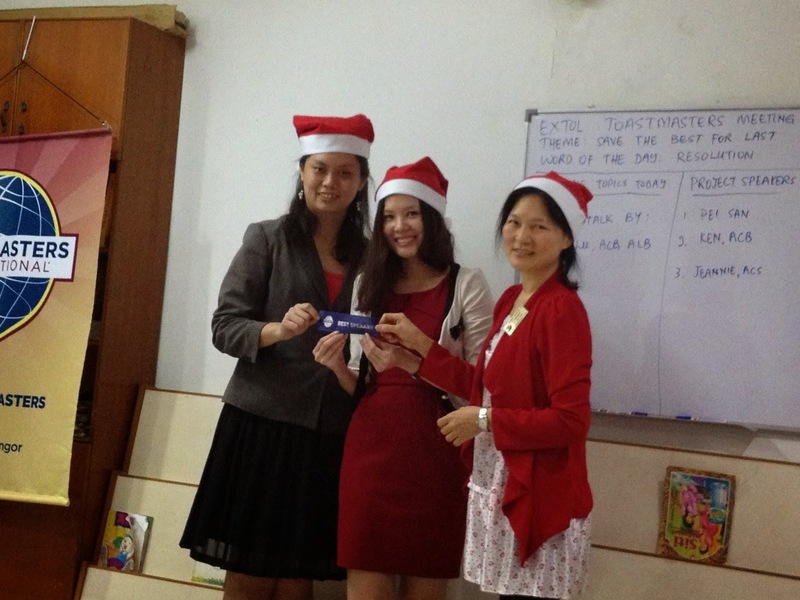 He also requested us to display our club members’ achievement record and to wear our name tags. We shall do so, General Evaluator. 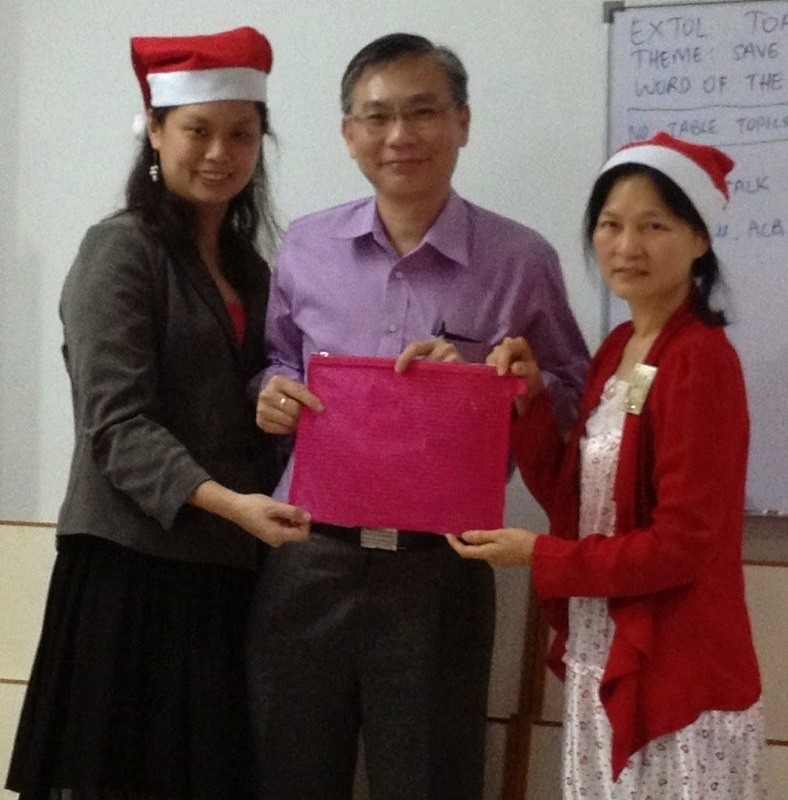 Thank you, Thian Seng, we definitely will invite you to our meetings again! 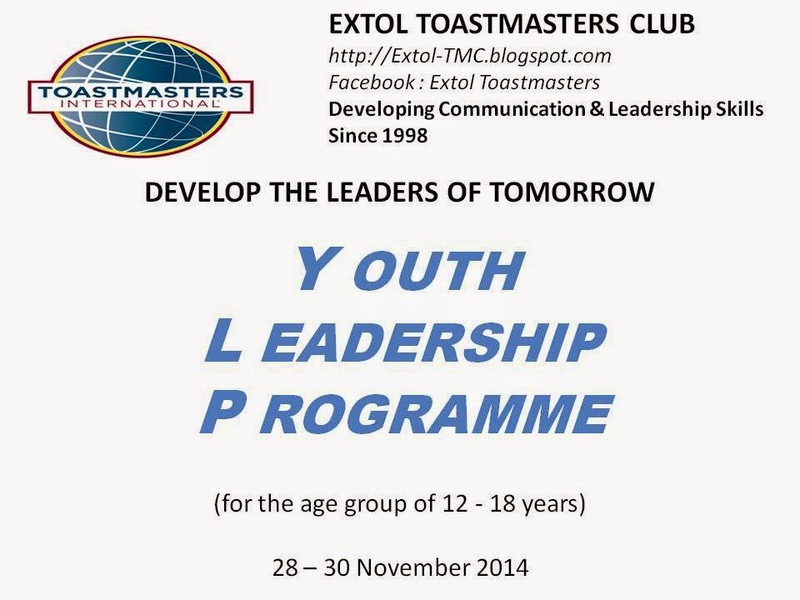 President, Jeannie, ACS reported that the Youth Leadership Programme conducted by Extol Toastmasters Club on 28-30 November 2014 was a successful one. 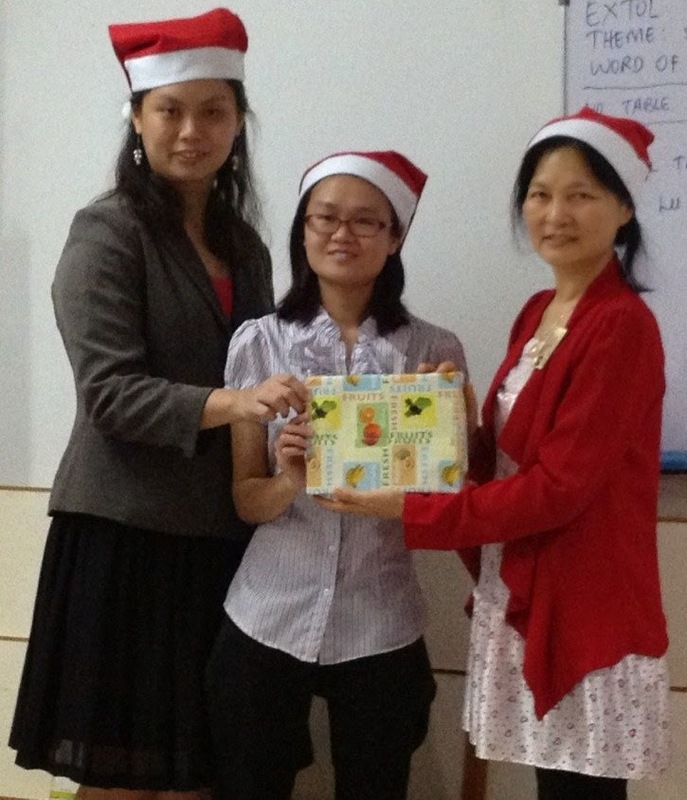 She thereby thanked all members who had assisted and made it possible. Well done, all club members! 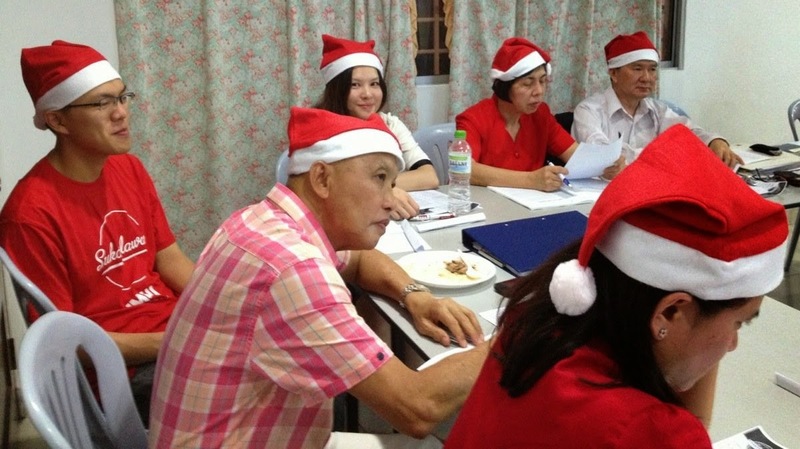 She also announced that the next meeting on 17 December 2014 is a Christmas-themed meeting and all are encouraged to bring along a gift of about RM10.00 each as gift exchange and the dress code is red and white. Let us come in full force to attend this last meeting in 2014. In addition, Alex Lu, ACB, ALB, a remisier in the Malaysian stock exchange and is attached with Kenanga Investment Bank Berhad will be conducting an investment workshop at the next meeting. All who are interested on ways to practice wise investment to increase their earnings are welcomed. 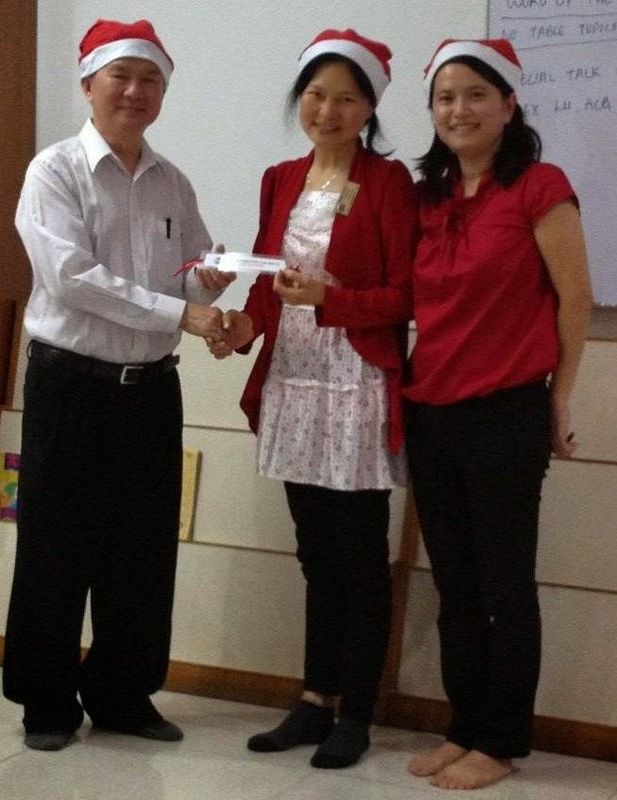 President, Jeannie, ACS also announced that the International Speech and Table Topics Contests will be conducted on 7 January 2015 at the meeting venue. 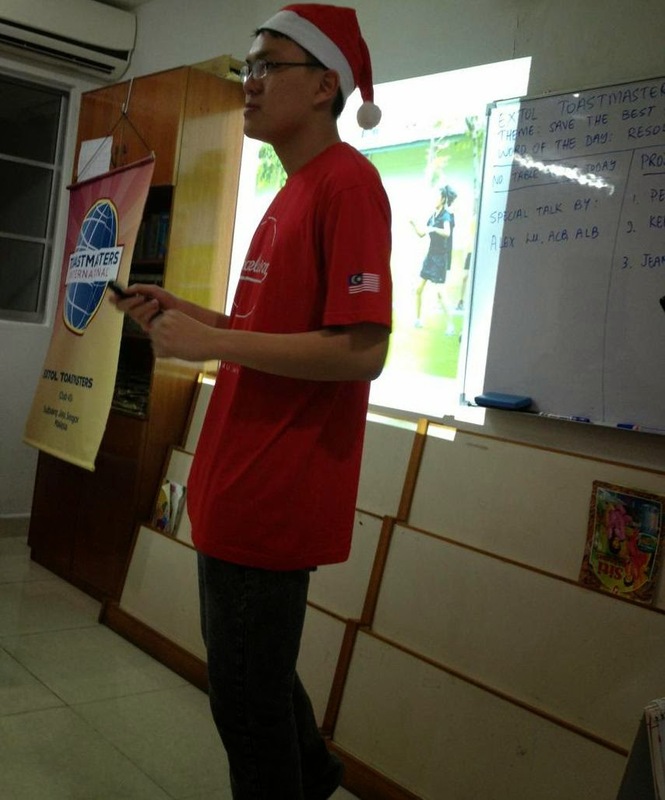 Immediate past President, Pun Yew Kee is the organizing Chair. Therefore, all interested to contest or take up roles, please report to him. Good night! 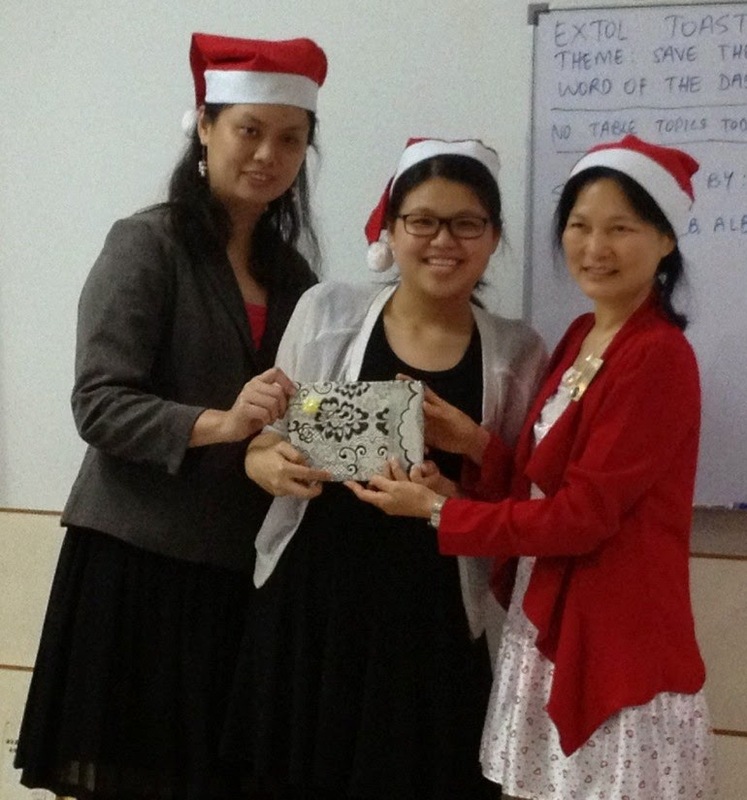 See you at our next meeting on 17 December 2014!